The human T-cell leukemia virus type 1 (HTLV-1) Tax protein indirectly influences transcriptional activation, signal transduction, cell cycle control, and apoptosis. The function of Tax primarily relies on protein-protein interactions. We have previously shown that Tax upregulates the cell cycle checkpoint proteins p21/waf1 and cyclin D2. Here we describe the consequences of upregulating these G1/S checkpoint regulators in HTLV-1 infected cells. To further decipher any physical and functional interactions between cyclin D2 and p21/waf1, we used a series of biochemical assays from HTLV-1 infected and uninfected cells. Immunoprecipitations from HTLV-1 infected cells showed p21/waf1 in a stable complex with cyclin D2/cdk4. This complex is active as it phosphorylates the Rb protein in kinase assays. Confocal fluorescent microscopy indicated that p21/waf1 and cyclin D2 colocalize in HTLV-1 infected, but not in uninfected cells. Furthermore, in vitro kinase assays using purified proteins demonstrated that the addition of p21/waf1 to cyclin D2/cdk4 increased the kinase activity of cdk4. These data suggest that the p21/cyclin D2/cdk4 complex is not an inhibitory complex and that p21/waf1 could potentially function as an assembly factor for the cyclin D2/cdk4 complex in HTLV-1 infected cells. A by-product of this assembly with cyclin D2/cdk4 is the sequestration of p21/waf1 away from the cyclin E/cdk2 complex, allowing this active cyclin-cdk complex to phosphorylate Rb pocket proteins efficiently and push cells through the G1/S checkpoint. These two distinct functional and physical activities of p21/waf1 suggest that RNA tumor viruses manipulate the G1/S checkpoint by deregulating cyclin and cdk complexes. HTLV-1 is the etiologic agent of adult T cell leukemia (ATL) and HTLV-1-associated myelopathy/tropical spastic paraparesis (HAM/TSP). The transforming ability of HTLV-1 is mainly due to the viral protein, Tax. One way in which this has been demonstrated is through the ability of Tax to induce tumors and leukemias in transgenic mice, and the ability to immortalize T-cells [1, 2]. Tax can also transactivate viral genes through three 21 bp cAMP response elements in the HTLV-1 long terminal repeat (LTR) , as well as alter the transcriptional activity of several transcription factors, including NF-κB and CREB . In addition, Tax targets cell cycle regulators such as p53, cyclin dependent kinases (cdks) 4 and 6, cyclin D2, and cdk inhibitors p21/waf1 and p16/INK4A [4–9]. Timing of the cell cycle has been shown to be tightly regulated by cyclins and their catalytic partners, cdks. These complexes regulate the cell cycle by phosphorylating the Retinoblastoma protein (Rb). Rb is a tumor suppressor protein that acts by binding to proteins such as E2F, c-Abl, and HDAC1 [10–12]. The differential phosphorylation of Rb by cyclin/cdk complexes allows for the release of Rb bound proteins at particular times in the cell cycle, thus regulating the transcription of specific genes, such as cyclin E and cyclin A [13, 14]. In addition, there are cyclin dependent kinase inhibitors (CDKIs) that generally act as negative regulators of the cell cycle by binding to cdks and inhibiting their kinase activity. Of particular importance is p21/waf1, a G1/S phase CDKI, which has been shown to be overexpressed in HTLV-1 infected cells [5, 6, 15]. p21/waf1 expression can be induced by the tumor suppressor protein, p53, in response to DNA damage . However, p21/waf1 can also be induced independently of p53 [17, 18]. In fact, in HTLV-1 infected cells, it has previously been shown that Tax transactivates p21/waf1 transcription independent of p53 and through E2A sites close to the TATA box [5, 19]. p21/waf1 differs from other cyclin/cdk inhibitors in that it has two cyclin binding sites, one localized within the N terminus and the other at the C terminus . p21/waf1 interacts with both cyclins and cdks, in contrast to the INK family CDKI members, which only bind to cdks . Interestingly, p21/cyclin A/cdk2 and p21/cyclin E/cdk2 complexes have consistently been demonstrated to be inhibitory complexes, whereas p21/cyclin D/cdk complexes are typically viewed as activating complexes [21–24]. The observation that p21/waf1 does not always act as an inhibitor of cyclin D/cdk complexes has been supported by numerous publications. For example, ectopic expression of cyclin D1 has been shown to induce p21/waf1 transcription, which does not lead to cell cycle arrest, but rather to stabilization of the cyclin D/cdk4 complex . p21/waf1 has also been shown to assist in the nuclear localization of cyclin D/cdk complexes [22, 26]. 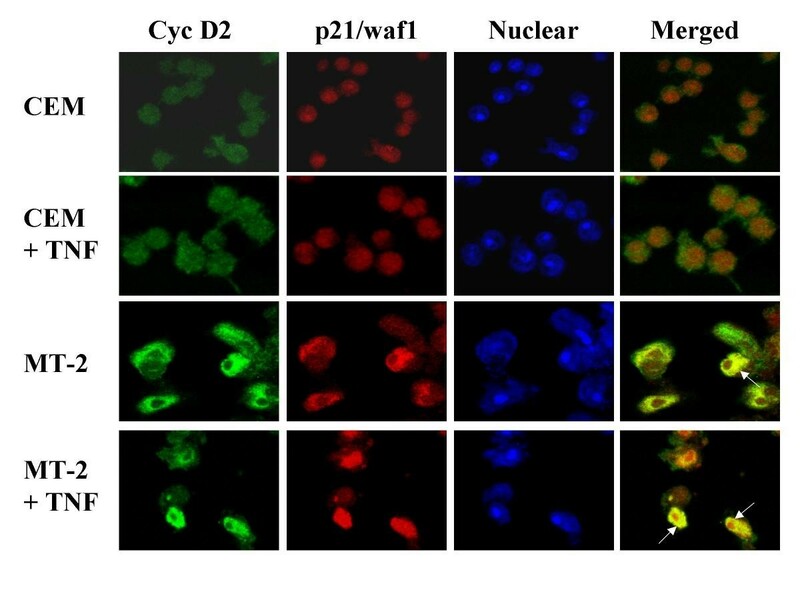 A recent report shows that p21/waf1 inhibits cyclin D1 nuclear export to the cytoplasm, thus providing a mechanism for nuclear accumulation of active cyclin D/cdk4 complexes . Furthermore, p21/waf1 has been shown to act as an assembly factor for cyclin D/cdk4 complexes [22–24, 26]. LaBaer et al. demonstrated that cyclin D/cdk4 complexes were unable to efficiently assemble in cells or in vitro, but in the presence of p21/waf1, the amount of cyclin D/cdk4 complexes increased. They also reported that only p21/waf1 and not other members of the CIP/KIP family performed this function. Finally, contrary to results seen with other G1 cyclin/cdk complexes, p21/waf1 is not only involved with stabilization and transport of cyclin D/cdk4, but also in the formation of active kinase complexes [20, 22, 24, 26]. Cell cycle deregulation is often a target for cancer progression, especially the shortening of the G1 interval of the cell cycle. Importantly, in HTLV-1 infected cells, Tax has been shown to increase cyclin D2 as well as p21/waf1 expression at the transcriptional level [5, 19, 28, 29]. This is an unusual circumstance in light of the fact that p21/waf1 is traditionally thought of as an inhibitor of cell cycle progression. An alternative explanation is that p21/waf1 acts as an assembly factor of cyclin D2/cdk associated complexes in HTLV-1 infected cells. This particular function appears to be p21/waf1's role in forming stable and active kinase complexes, which in turn could function to shorten the G1 phase in HTLV-1 infected cells. It has previously been shown that the HTLV-1 Tax protein shortens the G1 phase of the cell cycle [28, 30]. Therefore, transactivation of p21/waf1 by Tax could contribute to this effect. In this study, we demonstrated that p21/waf1 physically associates with cyclin D2/cdk4 in a very stable and kinase active complex. Through the use of confocal fluorescent microscopy, we found that p21/waf1 and cyclin D2 colocalize in HTLV-1 infected cells. Furthermore, using purified proteins, we showed that p21/waf1 facilitates the cyclin D2/cdk4 complex formation and activates the complex as well. Interestingly, when p21/waf1 was added in combination with cyclin D2 and cdk4, inhibition of kinase activity was not observed, whereas addition of p16/INK4A resulted in a strong inhibition of kinase activity. In addition, the cyclin E/cdk2 kinase activity was observed to be dramatically increased in HTLV-1 infected cells. Therefore, understanding the functional consequence of the association of p21/waf1 with cyclin D2/cdk complexes in HTLV-1 infected cells will help to gain insights into the viral mechanism of T cell transformation. Cell cycle regulatory genes are often targeted in tumorigenesis mainly due to their direct involvement in deregulating the cell cycle and increasing cell proliferation [31, 32]. In keeping with this, we have previously shown through microarray and RNase protection analysis of HTLV-1 infected cells, that cyclin D2 expression is upregulated [19, 28]. 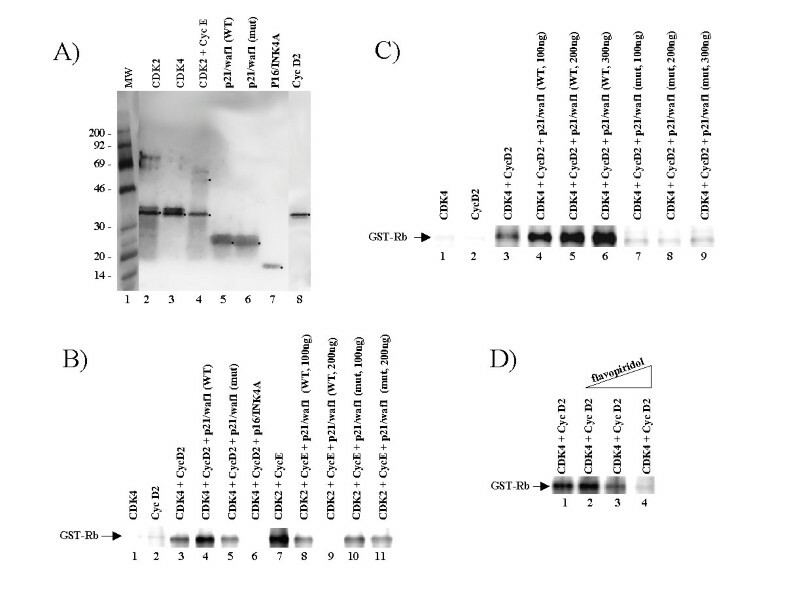 This overexpression of cyclin D2 was Tax dependent ; therefore, a control western blot showing Tax expression in C81 (HTLV-1 infected) cells as compared to CEM (uninfected T-cells) was performed (Figure 1A). To confirm that cyclin D2 is overexpressed in HTLV-1 infected cells, a western blot of cyclin D2 was done as shown in Figure 1B. Cyclin D2 levels were increased significantly in HTLV-1 infected cells as compared to uninfected cells (Figure 1B, compare lanes 1 and 2). The levels of cdk4, one of the major cdks that bind to cyclin D2, was also examined, and found to be unchanged in C81 and CEM cells (Figure 1B). p21/waf1 and cyclin D2 are overexpressed and in a stable kinase complex in HTLV-1 infected cells. (A) One hundred micrograms of total cellular protein from uninfected CEM and infected C81 cells were prepared, separated by reducing SDS-PAGE on a 4–20% gel, and blotted with anti-Tax polyclonal and anti-actin antibodies. The antigen-antibody complex was detected with 125I-protein G. The marker is a 14C-labeled Rainbow (high molecular weight) Marker. Positions are indicated in kiloDaltons. 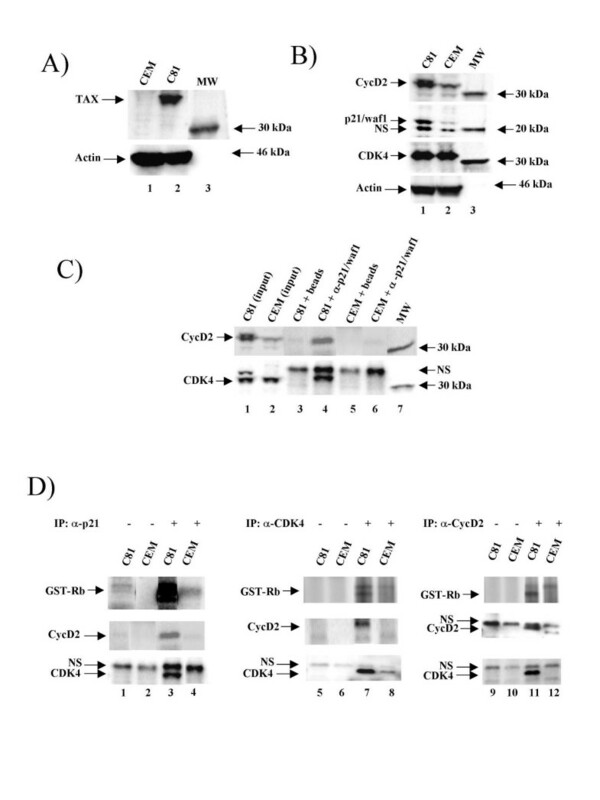 (B) Western blots were performed as described above using anti-cdk4 rabbit polyclonal, anti-cyclin D2 rabbit polyclonal, anti-p21/waf1 rabbit polyclonal and anti-actin goat polyclonal antibodies. (C) C81 and CEM cell extracts (3 mg) were IPed with anti-p21/waf1 monoclonal antibody or no antibody overnight at 4°C. The complexes were precipitated with protein A+G agarose beads and washed with TNE300 + 0.1% NP-40. Proteins were then separated by reducing SDS-PAGE on a 4–20 % Tris-glycine gel and transferred onto a PVDF membrane. All lanes in the top panel are western blotted with anti-cyclin D2 antibody. All lanes in the bottom panel are western blotted with anti-cdk4 antibody. NS indicates non-specific bands. (D) C81 and CEM cell extracts (3 mg) were IPed with anti-p21/waf1 mouse monoclonal, anti-cyclin D2 rabbit polyclonal, anti-cdk4 rabbit polyclonal antibodies, or no antibody overnight at 4°C. The complexes were precipitated with protein A+G agarose beads and washed twice with TNE300 + 0.1% NP-40, once with TNE50 + 0.1% NP-40, and twice with kinase buffer. Immune complexes were used for in vitro kinase assays using GST-Rb as a substrate. Kinase reactions (shown in the top panels) were separated on a 4–20 % Tris-glycine gel, dried, and exposed to a PhosphorImager cassette. Lanes 1, 5, and 9 are control lanes for C81 IPs and lanes 2, 6 and 10 are control lanes for CEM IPs, (IPs with only protein A+G agarose beads). Lower panels are control WBs for cdk4 and cyclin D2. Interestingly, p21/waf1 protein levels were also increased in HTLV-1 infected cells as shown in Figure 1B, lane 1. We have previously shown that p21/waf1 is upregulated in HTLV-1 infected cells, in both IL-2 dependent and IL-2 independent cells, and from ATL and HAM/TSP patient T-cells . In addition, through a CREB mutant Tax clone, CTLL (703), we have shown that the upregulation of p21/waf1 is dependent on the CREB binding motif of Tax . This up-regulation of p21/waf1 by Tax appeared to be in conflict with the role of Tax in promoting tumorigenesis. For this reason, the role of p21/waf1in HTLV-1 infected cells was further investigated by determining the binding partners of p21/waf1. Through a series of immunoprecipitations and western blots, we found that p21/waf1 was in a stable complex with cyclin D2 and cdk4 in HTLV-1 infected cells as shown in Figure 1C. This complex was resistant to 600 mM salt and 1% NP-40 wash conditions (data not shown). In contrast, p21/waf1 was unable to be detected in complex with cyclin D2/cdk4 in uninfected T cells. Collectively, these results are in agreement with previously published work demonstrating that cyclin D2 and p21/waf1 protein levels are dramatically increased in HTLV-1 infected cells [5, 15, 28]. In addition, p21/cyclin D2/cdk4 were found in a stable complex in HTLV-1 infected and not in uninfected cells. Previously it was demonstrated that p21/waf1 complexed with D type cyclins were active kinases [22, 26]. These reports, as well as our finding of a similar complex in HTLV-1 infected cells, led us to investigate the kinase activity of the cyclin D2/p21/cdk4 complex. Thus, in vitro kinase assays from both C81 and CEM cells were performed using GST-Rb as a substrate. Kinase assays were performed three times and results of a typical experiment are shown in Figure 1D. When immunoprecipitations with anti-p21/waf1 were performed, a dramatic increase in activity was observed in infected cells as compared to uninfected cells, as seen in Figure 1D (compare lanes 3 and 4). Immunoprecipitations with anti-cdk4 and anti-cyclin D2 were also performed. Immunoprecipitations from both HTLV-1 infected and uninfected cells using anti-cdk4 and anti-cyclin D2 antibodies were able to phosphorylate GST-Rb. However, immune complexes obtained from HTLV-1 infected cells appeared to display a more pronounced kinase activity (Figure 1D, compare lanes 7 to 8 and 11 to 12). It should be noted that immune complexes isolated with anti-cdk4 antibody from uninfected cells were more reproducibly active, whereas, uninfected cells repeatedly showed little or no kinase activity from anti-cyclin D2 precipitated immune complexes. Interestingly, HTLV-1 infected cells exhibited higher kinase activity from the p21/waf1 immunoprecipitation than from the cyclin D2 and cdk4 immunoprecipitation (compare lane 3 to lane 7 and 11). The reason for these differences is not known, but could result from the cyclin D2 or cdk4 antibodies interfering with substrate accessibility in the kinase assay. Alternatively, the antibody used for immunoprecipitation could be altering the complex formation resulting in decreased kinase activity. Control western blots for both cyclin D2 and cdk4 are shown below the kinase panels in Figure 1D. To confirm the interaction of p21/waf1 with cyclin D2 in HTLV-1 infected cells, co-localization studies utilizing MT-2 (infected) and CEM (uninfected) cells were performed. Fixed cells were stained for both p21/waf1 and cyclin D2 proteins as shown in Figure 2. Texas Red (TR) goat anti-mouse IgG was used as the secondary antibody for detection of p21/waf1 and fluorescein isothiocyanate (FITC) goat anti-rabbit IgG was used as the secondary antibody for detection of cyclin D2. In addition, TOTO-3, a dimeric cyanine nucleic acid stain from Molecular Probes, was utilized as a nuclear stain. Single color control experiments were performed by using secondary antibody with no primary antibody to determine the amount of background staining due to non-specific binding of the secondary antibody. Almost no background staining was observed in the control samples (data not shown). In both uninfected and infected cells, cyclin D2 and p21/waf1 staining were localized primarily to the nucleus. Nuclear stain as shown in the third panel depicted a dark blue area that represents the nucleolus, whereas the lighter blue staining represents the nucleoplasm. As expected, the intensity of staining for cyclin D2 and p21/waf1 was increased in HTLV-1 infected T-cells. When the red α-p21/waf1, TR image and the green α-cyclin D2, FITC image were merged, co-localization (depicted by the yellow coloring) could be seen mainly in the nucleoplasm of the HTLV-1 infected cells, while no co-localization was observed in uninfected cells. p21/waf1 and cyclin D2 colocalize in HTLV-1 infected cells. Cells were fixed with 2% paraformaldehyde and stained with rabbit polyclonal anti-cyclin D2 and mouse monoclonal anti-p21/waf1 antibodies, washed, and then stained with the secondary antibodies TR goat anti-mouse IgG and FITC goat anti-rabbit IgG. TOTO-3, a dimeric cyanine nucleic acid stain, was used as a nuclear stain. For induction of virus, TNF-α (10 ng/ml) was added for four hours. Confocal optical sections (z = 0.5 μm) are shown in all panels. In the nuclear panel, dark blue staining represents the nucleolus, whereas the lighter blue staining represents the nucleoplasm. The fourth column contains the merged FITC and TR channels. Arrows indicate points where colocalization is occurring, shown as yellow coloring when the two images are merged. Experiments were repeated three times and a representative sample from one experiment is shown. We next induced and activated a high titer of the virus by adding tumor necrosis factor alpha (TNF-α) to the cells. TNF-α has been shown to induce HTLV-1 gene expression in infected cells and Tax expressing cells in addition to having an enhanced localization effect on the NF-κB pathway . In addition, we have previously demonstrated that TNF-α induces HTLV-1 gene expression in HTLV-1 infected cells . After the addition of TNF-α, there was an increase of co-localization of cyclin D2 and p21/waf1 in the HTLV-1 infected cells as seen in Figure 2. Co-localization was still not observed in uninfected T-cells (Figure 2). These results further confirm that p21/waf1 and cyclin D2 are complexed together in HTLV-1 infected cells. p21/waf1 has been previously described as an assembly factor for cyclin D/cdk4 complexes [22–24, 26]. Therefore, it would be expected that cyclin D2 and p21/waf1 would be expressed at similar times in the G1 phase of the cell cycle. To observe the expression of cyclin D2 and p21/waf1 during the various stages of the cell cycle, a time course study for the expression of these proteins was performed. Cells were serum starved for 3 days (G0), stimulated with complete media, and processed every two hours for further analysis. To verify that the majority of cells were arrested in G0, transcription factor binding to the cyclin A promoter was analyzed. Takahashi et al., utilizing chromatin immunoprecipitation (ChIP) assays to examine the cyclin A promoter at various stages of the cell cycle, demonstrated that at G0 and early G1, the cyclin A promoter is repressed by being bound by both E2F4 and p130 . In contrast, cells that are at late G1 and S phase do not have E2F4 or p130 present at the cyclin A promoter. Therefore, ChIP assays were performed as a control to verify that the majority of the cells had been arrested in G0 (Figure 3A). Chromatin from CEM and C81 cells at both G0 and G1/S were incubated with control IgG, anti-E2F4, anti-p130 and anti-p300 antibodies, and primers for the cyclin A promoter (marker for late G1/S transcription) were used for PCR. In both infected and uninfected cells at G0, E2F4 and p130 (G0 markers) were present at the cyclin A promoter (Figure 3A, lanes 4, 5, 9, and 10). In contrast, an activator of transcription, p300, was not detected at the cyclin A promoter at G0 in either cell line. C81 cells at G1/S, in contrast, had no p130 and a decreased amount of E2F4 at the cyclin A promoter. In addition, p300 was recruited to the cyclin A promoter at the G1/S boundary. These results indicate that C81 and CEM cells were properly arrested at G0 and subsequently released into G1/S by addition of complete media. Cell cycle analysis of cyclin D2 and p21/waf1. (A) ChIP assays were performed using G0 cells (0 hour) and G1/S cells (6 hour) as described in the methods section. Cyclin A primers, specific for cyclin A promoter positions -135 to -113 and +13 to +33, were used to amplify DNA obtained from IPs using antibodies for E2F4, p300, and p130. PCR products were run on a 1% agarose gel and visualized with EtBr. Lane 1 is molecular weight marker and lanes 3 and 8 are control IgG. (B) Cells were synchronized at G0 by serum starvation for three days, followed by stimulation with complete media (containing 10% heat inactivated FCS) and collected at 0, 2, 4, 6, 8, and 10 hours. One hundred micrograms of total cellular protein from CEM, C81, human fibroblasts (HF), mouse embryonic fibroblasts (MEF), and NIH-3T3 cells were prepared, separated by reducing SDS-PAGE on a 4–20% gel, and blotted with anti-cyclin D2 rabbit polyclonal Ab. The antigen-antibody complex was detected as described in the methods section. (C) Cells were synchronized at G0 and processed as described above, with the exception that anti-p21/waf1 rabbit polyclonal antibody was utilized for western blotting. (D) Cells were serum starved for 3 days, stimulated, and samples collected at appropriate time points. Kinase assays were performed using GST-Rb as described in the methods section. Representative results of three independent experiments are shown here. (E) Immunoprecipitations and control western blots for part D were performed as described above. NS depicts non-specific bands. Next, western blots were performed for cyclin D2 and p21/waf1 to determine their expression levels during the early stages of the G1 phase, as shown in Figures 3B and 3C. HTLV-1 infected cells (C81) and uninfected T-cells (CEM) were examined along with NIH-3T3 cells, mouse embryo fibroblasts (MEF), and human fibroblasts (HF), as positive controls. The latter three cell lines were chosen as positive controls since there is published time course data on cyclin D and p21/waf1 expression in these cells as well as high kinase activity associated with them [23, 36–38]. In CEM cells, cyclin D2 levels remained relatively constant throughout the cell cycle with no distinct induction of expression (panel 1, Figure 3B). p21/waf1 in CEM cells was also at a low, constant, level (panel 1, Figure 3C). In C81 cells, there was an abundant amount of both cyclin D2 and p21/waf1 as early as 4 hours post release as seen in panel 2, Figures 3B and 3C. The presence of low levels of both cyclin D2 and p21/waf1 in C81 cells at 0 hours could be due to Tax expression at 0 hours (date not shown), based on the ability of Tax to transactivate both promoters [5, 28, 29]. HF cells exhibited a more gradual increase of both proteins, but levels of both p21/waf1 and cyclin D2 were significantly higher at 8 hours post release (panel 3, Figures 3B and 3C). MEF cells displayed a slight induction of cyclin D2 at 4 hours, but interestingly the cyclin D2 levels did not appear to be dramatically upregulated until p21/waf1 was induced at 10 hours after release (panel 4, Figures 3B and 3C). Finally, both cyclin D2 and p21/waf1 were dramatically induced at 6 hours post release in 3T3 cells (panel 5, Figures 3B and 3C). Interestingly, cyclin D2 and p21/waf1 expression levels closely mirrored each other and there was a lack of high cyclin D2 protein expression levels until the induction of p21/waf1 in all cell lines tested, with the exception of CEM. The time course study depicted times at which both proteins were co-expressed, thus providing points in the cell cycle that could be used to assess the kinase activity of the p21/cyclin D2 complex. Therefore, Rb phosphorylation was examined by kinase assays performed with complexes obtained at 4 hours post release in CEM and C81 cells and at 6 hours post release in HF cells, where most of the initial expression of cyclin D2 and p21/waf1 proteins were present (Figure 3D). Kinase assays were also performed with complexes obtained at 0 hours (G0) as a negative control. HF cells were chosen as the positive control because they are of human origin and thus are the closest to the human T-cell lines used in these studies. Also, p21/waf1 associated kinase activity has previously been reported in HF cells . Following immunoprecipitations from C81 and CEM cells, dramatic p21/waf1 associated kinase activity was observed in C81 cells 4 hours post release (Figure 3D, lanes 1). Little or no p21/waf1 associated kinase activity was observed in CEM cells at 4 hours post release (Figure 3D, lane3). As was expected no p21/waf1 associated kinase activity was observed at time zero (G0) in either CEM or C81 cells (Figure 3D, lanes 2 and 4). HF cells, as previously reported , demonstrated considerable kinase activity when immunoprecipitated with anti-p21/waf1 antibody at 6 hours post release, but showed no activity at the G0 phase, (Figure 3D, lanes 10 and 9 respectively). C81 cells immunoprecipitated with anti-cyclin D2 antibodies also demonstrated kinase activity at 4 hours post-release and no activity during the G0 phase (lanes 5 and 6, respectively). Again, the kinase activity associated with cyclin D2 immunoprecipitated complexes appeared to be lower than the kinase activity associated with p21/waf1 immunoprecipitated complexes. Immune complexes obtained using anti-cyclin D2 antibody from CEM cells had no detectable kinase activity at either the G0 phase (lane 8) or 4 hours post release (lane 7). These results indicate that in HTLV-1 infected cells at early G1 phase (4 hours), p21/cyclin D2/cdk complexes were kinase active. In contrast, in uninfected cells at early G1, cyclin D2/cdk4 kinase activity was not observed. Representative control western blots for the kinase assays are shown in Figure 3E. Interestingly, cdk4 is only found complexed with p21/waf1 and cyclin D2 in C81 cells at 4 hours. The lack of cdk4 in p21/waf1/cyclin D2 complexes in C81 cells at 0 hours and CEM cells at 0 and 4 hours may explain the observed loss of activity. We next examined the effect of various purified cell cycle complexes in an in vitro kinase assay. We first expressed HA-tagged cdk2, cdk4, p21/waf1 wildtype (WT), p21/waf1 mutant in cyclin binding site (mut), p16/INK4A, cyclin E, and cyclin D2 in insect cells, and purified them using affinity tag (12CA5 antibodies) chromatography. Following purification, an aliquot was separated by SDS-PAGE and silver stained to demonstrate purity. Results of a typical silver stained gel are shown in Figure 4A, where 300 ng of cdk2, cdk4, cdk2+cyclinE, p21/waf1 (WT) and p21/waf1 (mut), as well as 100 ng of p16/INK4A and cyclin D2 were analyzed. Effect of purified p21/waf1 and p16/INK4A on cyclin D2/cdk4 complex. (A) Recombinant cdk2, cdk4, cyclin E, p21/waf1 wildtype (WT), p21/waf1 mutant in the cyclin binding site (mut), p16/INK4A, and cyclin D2 were expressed and purified using affinity tag chromatography. Following purification an aliquot was separated on by SDS-PAGE on a 4–20% gel and silver stained for purity. Dots (.) represent authentic cell cycle proteins (B) In vitro kinase assays with purified cyclin D2, cyclin E, cdk4, cdk2, p16/INK4A, p21/waf1 (WT) and p21/waf1 (mut) were performed using GST-Rb as a substrate for 1 hour at 37°C and processed as described in the methods section. One hundred nanograms of cdk4, cyclin D2, p16/INK4A, cdk2, and cyclin E were used in the kinase assays. (C) In vitro kinase assays were performed using GST-Rb as described in the methods section. One hundred nanograms of cdk4 and cyclin D2 were used in the kinase assays. (D) In vitro kinase assays were performed using GST-Rb as described above. Concentrations of flavopiridol used were 10, 50, and 100 nM for lanes 2–4, respectively. We next utilized various combinations of cyclin/cdk complexes to determine their activity for GST-Rb phosphorylation. As shown in Figure 4B, cdk4 and cyclin D2 alone had no kinase activity (lanes 1 and 2). However, upon addition of a 1:1 ratio of each protein, the active complex phosphorylated GST-Rb in vitro (lane 3). Interestingly, upon addition of wildtype and not mutant p21/waf1, the cyclin D2/cdk4 complex became more active (lanes 4 and 5). The active complex was completely inhibited with the appropriate cdk4 inhibitor, p16/INK4A (lane 6). When examining the effect of co-expressed and purified cyclin E/cdk2 on GST-Rb, we found ample phosphorylation by this active kinase (lane 7). However, addition of wildtype, but not mutant p21/waf1, appropriately inhibited the cyclinE/cdk2 complex, implying that p21/waf1 is a true inhibitor of this late G1/S cyclin/cdk complex. To further examine the effects of p21/waf1 on cyclin D2/cdk4 associated kinase activity, kinase assays were performed using various amounts of both p21/waf1 (WT) and p21/waf1 (mut) as shown in Figure 4C. 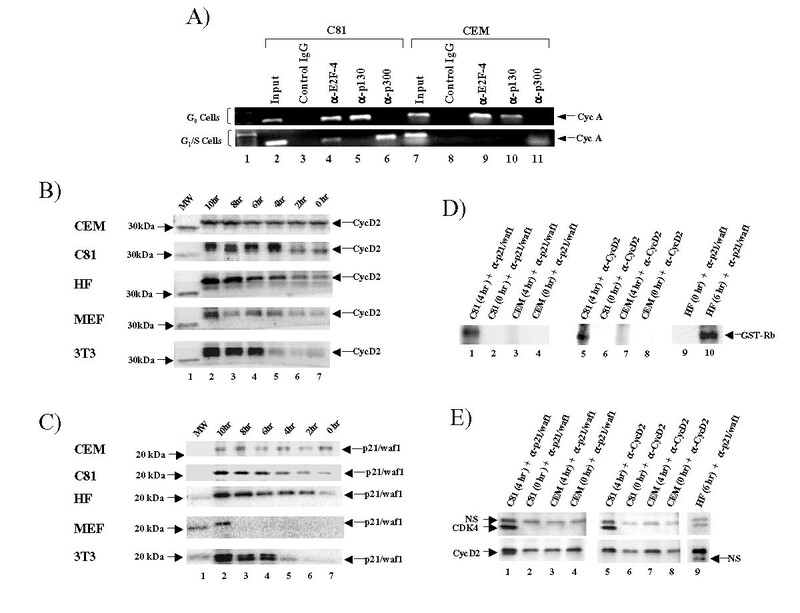 Again, cdk4 and cyclin D2 alone exhibited no kinase activity (lane 1 and 2), but when both purified proteins were present, kinase activity was observed (lane 3). An increase in kinase activity in the presence of p21/waf1 (WT) was observed (lane 4). Interestingly, the kinase activity continued to increase when greater amounts of p21/waf1 (WT) protein were added to the reaction (lanes 5 and 6), whereas the p21/waf1 (mut) protein did not have the same effect (lanes 7, 8, and 9). It is important to note that wildtype p21/waf1 has two cyclin binding motifs, one at the N- and the other at the C- terminus . p21/waf1 (mut) is mutated at the N-terminus and is therefore still able to bind to cyclins through the C-terminus, making this protein a possible transdominant mutant. Finally, to define an inhibitor that effectively inhibited cyclin D2 associated kinase activity, we used the chemical cdk inhibitor flavopiridol, an inhibitor of various cyclin/cdk complexes with a low IC50 (Figure 4D). Flavopiridol was used at 10, 50, and 100 nM concentrations and an efficient 50% inhibition of the cyclin D2/cdk4 kinase complex was observed at 50 nM (lane 3). Collectively, these results imply that the cyclin D2/cdk4 complex can further be activated by p21/waf1 and that effective inhibition of this complex can be achieved using chemical cdk inhibitors such as flavopiridol. Cyclin E is expressed late in the G1 phase after cyclin D expression and functions to further phosphorylate Rb, as well as other substrates such as histone H1 [13, 14]. p21/waf1, when complexed with cyclin E/cdk2, inhibits this phosphorylation and thus slows cell cycle progression. One theory as to why p21/waf1 is often found in cyclin D/cdk complexes is that cyclin D functions to sequester p21/waf1 away from cyclin E/cdk2 complexes [24, 39]. In HTLV-1 infected cells there was a dramatic increase in cyclin D2 levels, which could serve to efficiently sequester the high amounts of p21/waf1 away from cyclin E/cdk2. To investigate this hypothesis, western blots of both cyclin E and cdk2 were first performed to determine if there were equal amounts of protein expressed in uninfected and HTLV-1 infected cells. As can be seen in Figure 5A, similar levels of both cdk2 and cyclin E were observed in both cell types. Furthermore, a series of immunoprecipitations and western blots were performed to determine if cyclin E could be found in complex with p21/waf1. We were unable to detect p21/waf1 in complex with cyclin E in both infected and uninfected cells (data not shown); although cyclin E can be detected in a complex with p21/waf1 in both infected and uninfected cells after gamma-irradiation . Next, the levels of cyclin E/cdk2 associated kinase activity in HTLV-1 infected cells (C81) and uninfected cells (CEM) was investigated. In vitro kinase assays were performed using cyclin E immunoprecipitates and histone H1 as a substrate. Cdk2, but not cdk4 nor cdk6 can specifically phosphorylate histone H1. Various incubation times were used to demonstrate both the efficiency and the difference in kinase activity. As can be seen in Figure 5B, there were higher levels of cyclin E/cdk2 kinase activity in HTLV-1 infected cells as compared to uninfected cells (compare lanes 1, 2, and 3 to lanes 4, 5, and 6). At 45 minutes of incubation, HTLV-1 infected cells showed dramatic cyclin E/cdk2-associated kinase activity, as compared to uninfected T-cells (Figure 5B, compare lanes 3 and 6). Importantly, the levels of the substrate, histone H1, were similar in lanes 3 and 6, as shown by the Coomassie blue staining in the lower panel in Figure 5B. Figure 5C shows the relative levels of kinase activity, where HTLV-1 infected cells exhibited 3 to 5 times more cdk2 kinase activity than uninfected cells. Increased levels of cyclin E/cdk2 kinase activity in HTLV-1 infected cells. (A) Seventy-five micrograms of total cellular protein from CEM and C81 cells were prepared, separated by SDS-PAGE on a 4–20% Tris-glycine polyacrylamide gel, and blotted with anti-cyclin E rabbit polyclonal antibody or anti-cdk2 rabbit polyclonal antibody. (B) C81 and CEM cells extracts (3 mg) were IPed with anti-cyclin E polyclonal antibody overnight at 4°C. The complexes were precipitated with protein A+G agarose beads, washed with TNE600 + 0.1% NP-40 twice, and then with kinase buffer twice. The IP's were then used for in vitro kinase assays using histone H1 as a substrate and varying incubation times of 5, 30 and 45 minutes at 37°C. Kinase reactions were processed as described in the methods section. The bottom panel shows a coomassie blue staining of the gel. (C) Relative amounts of kinase activity as determined using the ImageQuant software. (D) Kinase assays were performed as described above using histone H1 as the substrate. H9 are uninfected T-cells and Hut 102 are HTLV-1 infected cells. To verify that the observed increase in cyclin E/cdk2 kinase activity in HTLV-1 infected cells was not limited to one cell line, another set of T-cells was examined. Similar results were obtained using H9 (uninfected) and Hut 102 (infected) cells. A representative kinase assay using these additional cell lines is shown in Figure 5D. Again, increased cdk2 kinase activity was observed in HTLV-1 infected cells (compare lanes 2 and 3 with 5 and 6). These results therefore suggest that the increased cdk2 activity observed is not limited to a single set of infected cells and rather is an observation applicable to most HTLV-1 infected cells. Based on these results, the difference in cyclin E/cdk2 activity is not due to differences in cdk2 or cyclin E protein levels, as seen in Figure 5A. Rather the sequestration of p21/waf1 by cyclin D2/cdk4 away from cyclin E/cdk2 complexes could explain these results. These data also suggest that the cyclin E/cdk2 complex is far more active in HTLV-1 infected cells and therefore can modulate the G1/S boundary with higher efficiency as compared to uninfected cells. G1 cell cycle regulators are often targets for deregulation in cancers [40–43]. Cyclin D is upregulated in many cancers, including breast cancer, and its role is to increase cellular proliferation, thus correlating with a poor prognosis. Conversely, the role of p21/waf1 is less clear-cut when it comes to tumorigenesis. In colon cancer, p21/waf1 expression, along with cyclin D1, correlated with patient survival . In gastric carcinoma, the loss of p21/waf1 indicated poor outcome, whereas Erber et al. showed that in 42 squamous cell carcinomas of the head and neck, increased p21/waf1 expression predicted poor disease outcome. In breast cancer, there have been conflicting results. High p21/waf1 levels have been seen as both a negative and positive prognostic marker . Therefore, it can be concluded that while the role of cyclin D in cancer progression and prognosis is well defined, the role of p21/waf1 is not entirely clear. In addition to cancer, the cyclin Ds and p21/waf1 are often seen deregulated in viral infections. For instance, cyclin D2 is upregulated in Epstein-Barr virus (EBV) infected cells [47, 48] and cyclin D1 is upregulated in Simian virus 40 (SV40) transformed cells . p21/waf1 expression is altered in Hepatitis C Virus (HCV) , EBV , Hepatitis B Virus (HBV) , and Cytomegalovirus (CMV) infected cells . In HCV infections, the NS5A protein represses transcription of p21/waf1 , whereas in CMV infected cells, p21/waf1 is targeted at the protein level for degradation . On the other hand, in EBV  and HBV infections , p21/waf1 has been shown to be up-regulated at the transcriptional level. It is interesting to note that EBV and HBV, both of which have increased p21/waf1 levels, are associated with the cancers, Burkitt's lymphoma and hepatocellular carcinoma, respectively [53, 54]. The observation that p21/waf1 is upregulated in virally induced cancers has been puzzling investigators for years. In this present work, a mechanism to explain the importance of p21/waf1 for viruses has been elucidated. Many oncogenic viruses contain a viral protein, such as the SV40 T antigen and human papillomavirus (HPV) E6 and E7 proteins, which aid in tumorigenesis by altering cell cycle progression. HTLV-1 Tax has been shown to have a profound effect on the cell cycle, through a variety of mechanisms. Tax has been shown to induce hyperphosphorylation of Rb  as well as transactivate the E2F-1 promoter . Therefore, it is not surprising that Tax can shorten the G1 phase of the cell cycle with an early onset of cdk2 kinase activity [28, 30]. Tax also has the ability to increase cdk4 associated kinase activity in HTLV-1 infected cells by binding to p16/INK4A, resulting in the inability of p16/INK4A to effectively inhibit cyclin D/cdk4,6 complexes [57, 58]. The interaction of Tax with p16/INK4A does not fully account for the increased activity of cyclin D/cdk4,6 complexes, because cells null for p16/INK4A expression retain increased cdk4 kinase activity [55, 56]. More recently, Tax has also been shown to be able to directly bind to cdk4, resulting in increased cyclin D/cdk4 associated kinase activity [59, 60]. We propose an additional mechanism in which Tax can function to alter cell cycle progression, through the upregulation of both p21/waf1 and cyclin D2, promoting the formation of highly active kinase complexes. Our laboratory and others have shown that in HTLV-1 infected cells and Tax expressing cells, cyclin D2 and p21/waf1 levels are upregulated through Tax transactivation [5, 15, 19, 28, 29]. The role of cyclin D2 in promoting tumorigenesis is easily understood as it functions to phosphorylate Rb. It therefore follows that if there are more active cyclin D2/cdk4 complexes available to phosphorylate Rb, the faster the cell can progress through the G1 phase of the cell cycle. The role of p21/waf1, on the other hand, is less easily understood and seems to be in conflict with the tumorigenic role of Tax. As an inhibitor of cyclin/cdk complexes it would be expected that p21/waf1 would slow down the cell cycle or even cause a G1/S block. During preparation of this manuscript, Kawata et al. published a report showing the importance of p21/waf1 for Tax-mediated transformation. They showed that when p21/waf1 was co-expressed with Tax in Rat-1 fibroblasts, colony formation in soft agar was increased. In addition, they also showed that p21/waf1 protects Tax expressing Rat-1 cells from apoptosis. This recent paper highlights the importance of p21/waf1 in the transformation and survival of cells. Our study of p21/waf1 has led to an alternative view of p21/waf1 as an activator/assembly factor, rather than a traditional cdk inhibitor in HTLV-1 infected cells, providing an additional explanation for Tax mediated overexpression of p21/waf1 in infected cells. When p21/waf1 is complexed with cyclin D2 it can be viewed as a positive regulator of the cell cycle. p21/waf1 accomplishes this in a variety of ways. One is by acting as an assembly factor for cyclin D2/cdk complexes. Our time course studies depicted a pattern of cyclin D2 levels not being fully induced until p21/waf1 protein expression was observed. These data support the hypothesis that p21/waf1 acts as an assembly factor for cyclin D2/cdk complexes in HTLV-1 infected cells. Furthermore, it has been shown that the cyclin Ds are less stable than other cyclins and thus need p21/waf1 to bring them into a stable complex with cdks [24, 26]. This is further supported by the fact that p21/cyclin D2/cdk4 are in a stable complex in HTLV-1 infected cells. By confocal fluorescent microscopy, we demonstrated that p21/waf1 and cyclin D2 co-localize, adding another layer of certainty that the p21/cyclin D2/cdk complex functions as a single unit. By stabilizing cyclin D2/cdk4 complexes, p21/waf1 becomes associated with the active form thus allowing cyclin D2/cdk4 to efficiently phosphorylate Rb. This is shown in HTLV-1 infected cells by the dramatic kinase activity associated with p21/waf1 as compared to little or no kinase activity associated with p21/waf1 in uninfected cells. In vitro kinase assays using purified proteins confirm this data, where cyclin D2/cdk-associated kinase activity was increased upon the addition of WT p21/waf1. Conversely, in the presence of mutant p21/waf1 protein, the kinase activity of the cyclin D2/cdk4 complex was decreased. A model depicting the control of cdk4 activity is shown in Figure 6A. This model illustrates that cdk4 alone will exhibit no kinase activity, but when its cyclin binding partner is bound, the complex will become kinase active. Interestingly, in uninfected T-cells we could detect very little cyclin D2-associated kinase activity, but cdk4 kinase activity was more robust. This could be possibly due to the fact that in uninfected T-cells, cyclin D3 is the major D type cyclin . Therefore, it is possible that most of the cdk4 kinase activity is associated with cyclin D3 in uninfected T-cells, whereas in HTLV-1 infected cells the cdk4 kinase activity is associated with cyclin D2. However, in infected cells, cyclin D2/cdk activity is optimal when p21/waf1 is found in this complex. Active p21/cyclin D2/cdk4 complexes in HTLV-1 infected cells allow for the increased phosphorylation of Rb and faster progression into the S phase. (A) Relative activity associated with cdk alone, cdk complexed with cyclin D2, and the cyclin D2/cdk/p21 complex, in both HTLV-1 infected and uninfected cells. (B) Diagram of the mechanism in which HTLV-1 alters the cell cycle in order to cause transformation. Tax transactivates both p21/waf1 and cyclin D2, which form a ternary complex with cdk4. This complex functions to phosphorylate Rb as well as to sequester p21/waf1 away from cyclin E/cdk2 complexes. Cyclin E/cdk2 complexes are thus free to further phosphorylate Rb and other cdk2 substrates. The net effect is the increased phosphorylation of Rb and other cdk substrates allowing the cell to enter the S phase more rapidly. It has been suggested that p21/waf1 only acts as an inhibitor of cyclin D/cdk4 complexes when there is more than one p21/waf1 bound . Harper et al. found that inactive cyclin/cdk complexes contain more than one molecule of p21/waf1. Indeed, in HTLV-1 infected cells, upon the induction of DNA damage with gamma-irradiation, new p21/waf1 is synthesized and a decrease in kinase activity is seen . Furthermore, Haller et al. showed that Tax binds to cyclin D2, D3 and cdk4, resulting in increased cdk4 kinase activity and the ability to overcome the inhibitory effects of p21/waf1. This was shown by transfections of cyclin D2, cdk4 and p21/waf1 into 293 cells. While inhibition of cdk4 kinase activity was demonstrated by the transfection of p21/waf1 in the absence of Tax, it is possible that the amount of p21/waf1 being expressed in these transfected cells exceeds the ratio of p21/waf1 to cyclin D when p21/waf1 would act as an assembly factor. A western blot of p21/waf1 before transfection demonstrated that almost no p21/waf1 was expressed in 293 cells. In addition, p16/INK4A levels, the major cdk4 inhibitor, were not taken into account. Therefore, the combination of endogenous p16/INK4A and the high levels of transfected p21/waf1 in the 293 cells could explain the decrease in cdk4 kinase activity observed. In the case of HTLV-1 infected cells with no DNA damage and untransfected conditions, both p21/waf1 and cyclin D2 are overexpressed. This allows for a scenario where the p21/cyclin D2 ratio has not changed, rather only the abundance of the complex has increased. Another important consequence of the interaction of p21/waf1 with cyclin D2 is the sequestration of p21/waf1 away from cyclin E/cdk2 complexes [22, 24, 26, 39]. The increased cyclin E/cdk2 associated kinase activity observed in HTLV-1 infected cells versus uninfected cells supports this theory. This is important since the cyclin E/cdk2 and cyclin D/cdk complexes phosphorylate different sites on Rb and thus have distinct functions in the progression of the cell cycle . The phosphorylation of Rb by cyclin D/cdk4 complexes allows the release of the transcription factor, E2F, from Rb bound complexes. E2F is then free to bind to the cyclin E promoter and activate transcription of cyclin E. Cyclin E is expressed late in the G1 phase and helps to regulate the transition into the S phase. Cyclin D knockout mice can be rescued by a cyclin E "knockin", demonstrating that cyclin E is a major downstream target of cyclin D1 . This also shows that activation of cyclin E is pertinent to transition from G1 to the S phase. 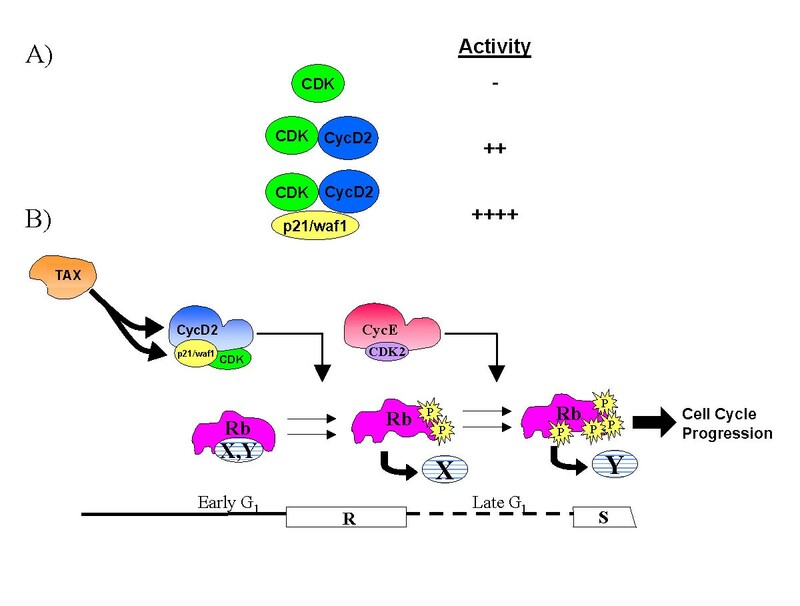 The role of cyclin E/cdk2 in cell cycle progression goes beyond phosphorylating Rb. The complex has been shown to inhibit p27/Kip1 action by phosphorylation of p27/Kip1 as well as to activate the transcription factor E2F5, again by a phosphorylation mechanism . Thus the sequestration of p21/waf1 by cyclin D/cdk complexes prevents inhibition of cyclin E/cdk2, allowing the phosphorylation and altered activity of multiple cell cycle regulators, Rb and histone H1 in particular. These altered activities influence the rate in which the infected cell can proceed through the G1 phase of the cell cycle. Cereseto et al. proposed that HTLV-1 infected cells have constitutive cyclin E/cdk2 activity due to limiting amounts of p27/Kip1. While this may contribute to the increased cyclin E/cdk2 kinase activity seen in HTLV-1 infected cells, the large amounts of p21/waf1 present in HTLV-1 infected cells argues against this being the most responsible factor. p21/waf1 is a potent inhibitor of cyclin E/cdk2 complexes and without another molecular sink (i.e., cyclin D/cdk complexes), p21/waf1 would inhibit cyclin E/cdk2 in HTLV-1 infected cells. There may be yet another contribution to the increased cyclin E/cdk2 activity observed in HTLV-1 infected cells. We have observed Tax in complex with cdk2 . We obtained these results using anti-Tax polyclonal antibodies and not the standard TAb monoclonal antibodies available to many of us. Therefore, we suspect that Tax complexed with cyclin E/cdk2 may increase its activity. Although we have no formal evidence to support this, future studies are aimed at examining the kinase activity of this potential cyclin E/cdk2/Tax complex. In summary, our results demonstrate that p21/cyclin D2/cdk4 complexes are important in the transformation of HTLV-1 infected cells. The abundance of p21/cyclin D2/cdk4 complexes in infected cells has the effect of shortening the G1 phase of the cell cycle. This is accomplished through increased phosphorylation of Rb, promoting earlier entry into the S phase. The abundance of active p21/cyclin D2/cdk4 complexes, combined with cyclin E/cdk2 complexes free of p21/waf1, allows for a further increase in phosphorylation of Rb and other cdk substrates. A model depicting the increase in cell cycle progression occurring in HTLV-1 infected cells is shown in Figure 6B. A shorter G1 phase of the cell cycle allows cells less time to repair any possible mutations that have occurred, providing an additional mechanism by which HTLV-1 is capable of promoting transformation. Further study on the role of p21/waf1 and cyclin D2 in HTLV-1 infected cells will allow us to gain a more thorough understanding of how the virus manipulates the cell cycle in order to cause transformation. MT-2, Hut 102 and C8166 (C81) are HTLV-l infected T-cell lines, whereas CEM (12D7) and H9 are uninfected human T-cell lines established from patients with T-cell leukemia [67, 68]. All cells were grown in RPMI 1640 containing 10% fetal bovine serum (FBS), 1% L-glutamine, and 1% streptomycin/penicillin. G0 synchronization for mouse embryo fibroblasts (MEF), NIH-3T3 and primary human fibroblasts (HF) cells was performed as previously described [36, 38, 69]. Briefly, cells were brought to 95 % confluency, washed, and cultured in serum-free DMEM for 3 days. To stimulate cells DMEM plus 10% heat inactivated fetal calf serum (HIFCS) was added. Samples were then processed every two hours using the scraping method. 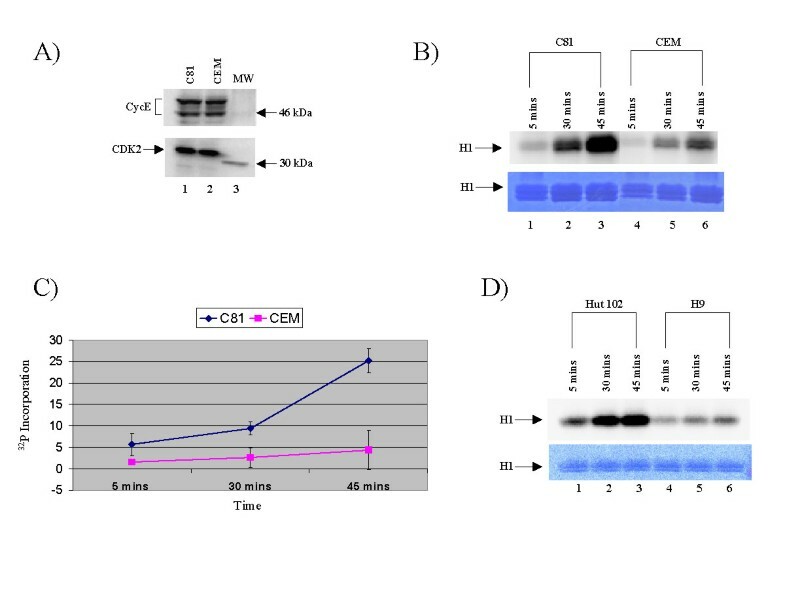 For G0 synchronization in CEM and C81 cells, cells were washed and cultured in serum-free RPMI 1640 for 3 days and samples were subsequently induced to enter the cell cycle by addition of 10% HIFCS. Samples were processed every two hours for western blots and kinase assays. Whole cell extracts were prepared as previously described . Anti-cyclin E (M-20) rabbit polyclonal, anti-p21/waf1 (187) mouse monoclonal, anti-p21/waf1 (C-19) rabbit polyclonal, anti-cdk4 (H-303) rabbit polyclonal, and anti-cyclin D2 (C-17) rabbit polyclonal antibodies, were purchased from Santa Cruz Biotechnology. Anti-cdk2 (06–505) rabbit polyclonal antibody was obtained from Upstate Biotechnology. Anti-Tax rabbit polyclonal antibody was a kind gift from Dr. Scott Gitlin. Western blots were performed as previously described . A total of 2–3 mg of cellular proteins and 5 μg of appropriate antibody (anti-cyclin E, D2, cdk4 or p21/waf1) were used. Samples were rotated overnight at 4°C and the next day protein A and protein G agarose beads (Oncogene Research Products/Calbiochem catalog IP05) were added. This mixture was rotated for 90 minutes at 4°C. Samples were washed twice in the appropriate TNE buffer plus 0.1% NP-40 and once in TNE50 (100 mM Tris-HCl [pH 8.0], 50 mM NaCl, 1 mM EDTA) plus 0.1% NP-40. Complexes were analyzed by reducing SDS-PAGE on a 4–20% Tris-glycine gel. Cell extracts were immunoprecipitated (IP) overnight with the appropriate antibody. Protein G and protein A agarose beads were added to IPs and rotated for 2 hrs at 4°C. IPs were washed twice with the appropriate TNE buffer, once with TNE50 + 0.1% NP-40, and twice with kinase buffer (50 mM HEPES, 10 mM MgCl2, 5 mM MnCl2, 1 mM DTT, 50 mM NaF, 0.2 mM Na3VO4 and one complete tablet of protease cocktail inhibitor/ 50 ml buffer). The appropriate substrate was added (GST-Rb aa 379–791 or histone H1, 200–400 ng) to each tube, with 1 μl of [γ32P]-ATP (3000 Ci/mmol). Reactions were incubated at 37°C for 1 hour and stopped by the addition of 15 μl of 2X SDS sample buffer. The samples were separated by reducing SDS-PAGE on a 4–20% Tris-glycine gel. Gels were stained with Coomassie blue, destained, and then dried for 2 hr. Following drying, they were exposed to a PhosphorImager cassette and analyzed utilizing Molecular Dynamic's ImageQuant Software. In vitro kinase assays with purified HA-tagged cyclin D2, cyclin E, cdk4, cdk2, p16/INK4A and p21/waf1 were performed for 1 hour at 37°C and processed as indicated above. Poly L-Lysine slides (LabScientific, Inc.) were autoclaved and placed in large dishes with 5 × 106 cells overnight. The next day 10 ng/ml tumor necrosis factor-α (TNF-α) was added to appropriate plates for 4 hours, washed, and fresh media added for overnight incubation. Slides were then washed twice with D-PBS without Mg2+ and Ca2+. Cells were fixed overnight with 2% paraformaldehyde. The next day, cells were permeabilized for 10 minutes with 0.2% Triton X-100 in D-PBS without Mg2+ and Ca2+. Slides were then washed with D-PBS without Mg2+ and Ca2+ and blocked for 10 minutes with 10% bovine serum albumin (BSA). The primary antibody, (1:200 dilution) in 10% BSA, was added and incubated for one hour, in the dark, at 37°C. Primary antibodies used were mouse monoclonal anti-p21 (187) and rabbit polyclonal anti-cyclin D2 (C-17) from Santa Cruz. Slides were then washed three times with D-PBS plus 300 mM NaCl and 0.1% Triton X-100 for 3 minutes. Secondary antibodies (1:50), in 10% BSA, were added and the slides were again incubated for 1 hour, in the dark at 37°C. Secondary antibodies used were fluorescein isothiocyanate (FITC)-goat anti-rabbit IgG and Texas Red (TR)-goat anti-mouse IgG from Santa Cruz. The previous washes were repeated. Slides were then incubated at room temperature for 20 minutes with 2 μM of TOTO-3, a dimeric cyanine nucleic acid stain from Molecular Probes, for nuclear staining. Slides were washed briefly with H2O and the excess liquid was removed. Prolong anti-fade (Molecular Probes) was added to the slides to prevent photo-bleaching. After drying the coverslips were sealed. Slides were viewed with a Bio-Rad MRC1024 confocal laser scanning microscope (Center for Microscopy and Image Analysis, George Washington University) using the 60 × objective. Optical sections were taken using z-dimensions between 0.5–1.0 μm. Pictures were produced using Adobe Photoshop 5.0 and Bio-Rad plug-ins. We performed ChIP using a modification of previously published methods [70, 71]. Approximately 5×107 cells were grown on 175-cm2 flasks and cross-linked by addition of formaldehyde (1% final concentration). Cross-linking was allowed to proceed at room temperature for 10 min and was terminated by the addition of glycine (final concentration 0.125 M). Cells were washed with PBS three times. Next, cells were collected by centrifugation and were rocked in buffer containing 50 mM HEPES (pH 7.5), 140 mM NaCl, 1 mM EDTA, 10% glycerol, 0.5% NP-40, 0.25% Triton X-100, and protease inhibitors (1 mM AEBSF, 1 mM benzamidine, 50 μg/ml TLCK, 50 μg/ml TPCK, 10 μg/ml aprotinin, 1 μg/ml leupeptin, 1 μg/ml pepstatin A) at 4°C for 10 min. Cells were collected by centrifugation at 4000 rpm for 10 min and the resulting pellet was resuspended in 200 mM NaCl, 1 mM EDTA, 0.5 mM EGTA, 10 mM Tris (pH 8), and protease inhibitors and incubated 10 min at room temperature. Nuclei were collected by centrifugation at 4000 rpm for 10 min, resuspended in sonication buffer (1 mM EDTA, 0.5 mM EGTA, 10 mM Tris at pH 8, and protease inhibitors), and sonicated on ice for 10 cycles to obtain an average DNA length of 500 to 1200 bp. Chromatin was pre-cleared with a mixture of protein A and protein G agarose (blocked previously with 1 mg/ml salmon sperm DNA and 1 mg/ml BSA) at 4°C for 10 min, three times. Pre-cleared chromatin was incubated with 50 μl of antibody in TE buffer containing 1% Triton X-100, 0.1% sodium deoxycholate (DOC), and protease inhibitors at 4°C overnight. Next, 40 μl of a 30% slurry of blocked protein A/G agarose was added and immune complexes were recovered. Immunoprecipitates were washed seven times with RIPA buffer (0.5 M LiCl, 50 mM HEPES at pH 7.5,1 mM EDTA, 1% NP-40, 0.7% DOC, and protease inhibitors). Pellets were resuspended in 100 μl of TE and incubated at 55°C for 1.5 hr with 10 μg each of RNAse A and proteinase K. Cross-links were reversed by incubating samples at 65°C for 4 hrs and samples were extracted with phenol:chloroform and ethanol precipitated. Pellets were resuspended in 20 μl of H2O and assayed by semi-quantitative PCR. Thirty cycles of PCR were performed in 25 μl with 5 μl of immunoprecipitated material, 10 pmole of cyclin A primers (-135 to -113 for the 5'primer and +13 to +33 for the 3' primer), and 0.125 units of Taq DNA polymerase. Finally, PCR products were electrophoresed on 1% agarose gels and visualized. This work was supported in part by NIH grants AI44357, AI43894, and the Alexandria and Alexander Sinsheimer foundation grant to FK. Both Fatah Kashanchi and Maria Elena Bottazzi are senior co-authors on the present manuscript. We would like to thank Scott Gitlin (University of Michigan, Ann Harbor) for the kind gift of the anti-Tax polyclonal Ab. KK carried out many of the biochemical studies, performed the confocal microscopy and drafted the manuscript. LD performed kinase assays. CD and KS participated in the immunoassays. KW, AM, and SB participated in the design of the study. RR gave valuable help with the confocal microscopy. AP, MEB, and FK participated in the design and coordination of the study. All authors read and approved the final manuscript.